NEW YORK -- The National Hockey League, in conjunction with the City of Ann Arbor, will extend the celebration of the Jan. 1 outdoor game between the Detroit Red Wings and the Toronto Maple Leafs with its official 2014 Bridgestone NHL Winter Classic Spectator Plaza, a free fan festival just outside the gates of Michigan Stadium on the University of Michigan campus. ·Bridgestone's Consumer Interactive Tire Experience, where fans can get in the game and play EA Sports NHL 14, get an NHL Winter Classic photo taken inside the Bridgestone Testimonial Booth, receive advice on the perfect tire for their needs and become educated on each tire sub-brand. Fans also can enter into The Ultimate Journey Sweepstakes (by completing a short survey) for a chance to win an exclusive Bridgestone vacation package. ·Coors Light, the Official Beer of the NHL, will have two professional ice sculptors carving five-foot-tall Detroit Red Wings and Toronto Maple Leafs logos during the pre-game festivities in Spectator Plaza, with ice-cold Coors Light available for purchase to fans 21 years and older. 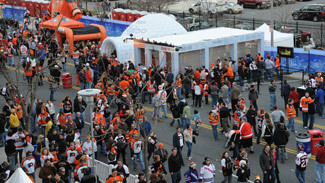 ·McDonald's will be serving its Premium Roast Coffee for free at Spectator Plaza to help keep visitors and fans warm. ·Fans can "drive to the net" at Spectator Plaza with Honda and take photos scoring the game-winning goal at the Official Vehicle of the NHL's interactive tent. The new, redesigned Honda Odyssey also will be on display. ·Verizon will showcase the NHL GameCenter mobile app and other innovations. 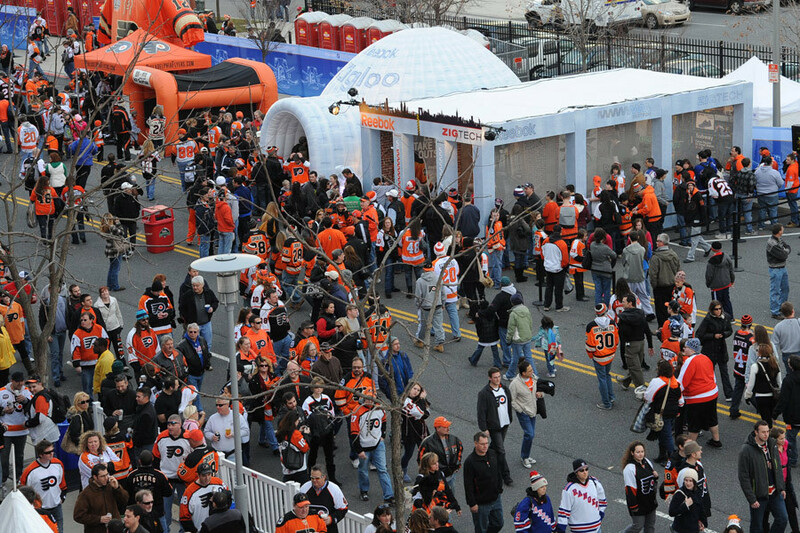 Visitors to the Verizon tent also will have the opportunity to win special prizes, check out exclusive content and receive a commemorative 2014 Bridgestone NHL Winter Classic bracelet. ·At the fast-acting Advil tent, fans can enter for a chance to win a special edition air-brushed goalie mask being created live by an artist well-known in the industry, get game-ready with eye-black and temporary tattoos for kids, and pick up a sample of new fast-acting Advil, the Official Pain Reliever of the NHL. ·ANCO Wiper Blades, Official Wiper Blades of the NHL, will test fans' accuracy in a Street Hockey Tune-Up at the ANCO tent. Fans who hit four targets without missing the net will win a coupon for free ANCO wipers. Visitors also will be able to enter for a chance to win free wiper blades and can learn about ANCO's world-class wiper technologies. ·Fans can step into the virtual FOX Sports Detroit studio to "snap" a photo of themselves broadcasting a game. The FOX Sports Detroit Girls will be on hand to take photos with fans and sign autographs; FOX Sports' Cleatus the robot is expected to make a special appearance. ·At the NHL Network and Xfinity interactive area, fans can record and upload their New Year's resolutions to share with friends and family as part of NHL Network's #MyGoalNHL campaign. Participants will be able to register for a chance to win a trip to the 2014 NHL Awards in Las Vegas and also pick up a 2013-14 NHL Network calendar, great for keeping up with all of the key events and programming in the upcoming months. ·At the Panini America booth, fans will receive a free NHL Sticker Album and NHL Winter Classic sticker sheet plus a free pack of NHL trading cards (while supplies last). ·At Reebok-CCM's interactive space, fans can gear up like the pros and try on the newest Reebok-CCM gear. Visitors also can test Reebok-CCM sticks out at the Deflection Zone and experience what it feels like to score in the big game. ·The Scotiabank Warming Zone will provide guests with an escape from the cold. Guests will be treated to complimentary beverages while they warm up and enjoy some of the pre-game television coverage. ·Fans can make their own free hockey card, play a game of Upper Deck Bubble Hockey, try their hand at Lucky Pack and check out hockey collectibles at the Upper Deck booth. ·Hockey players of all skill levels can try their luck at shooting pucks into an old washing machine and dryer – just like the pros – at the Ticketmaster Target Practice Challenge. ·The Toronto Maple Leafs Mobile Fan Zone will provide fans of all ages with a behind-the-scenes look at a replica Maple Leafs dressing room. The Mobile Fan Zone allows fans to live the dream as though they have just been added to the Maple Leafs' roster. NHL Winter Classic exhibit from the Hockey Hall of Fame, learn about new products from York and pick up branded hand warmers to stay warm during the game. Brena, an alt-pop band from nearby Grand Rapids, Mich., will play during the pre-game celebration at Spectator Plaza beginning at 10:30 a.m. ET.